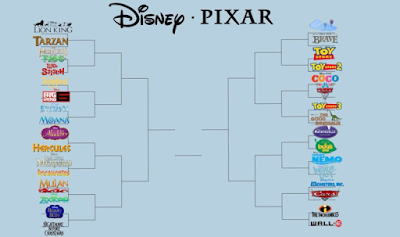 Disney vs Pixar Bracket: Who Wins? March Madness has just finished, and with that came a bunch of different brackets. People created brackets based on music, sports and TV shows, but they also made some for film. During this time one bracket stood out over every other: The Disney/Pixar bracket. 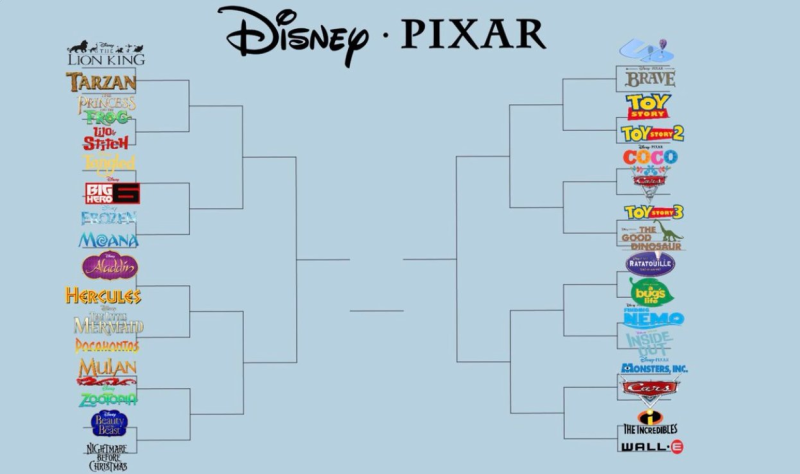 Being a fan of both Disney and Pixar, I figured that this would be the best one for me to tackle. Broken down will be every round, what I voted for and an explanation as to why I made every decision. The Princess and the Frog vs Lilo and Stitch: Whilst TPatF is the final hand drawn Disney film and I love the style, Lilo and Stitch has a beautiful watercolour illustration, and I am more connected to the story. Tangled vs Big Hero 6: This was the toughest decision in this block. Big Hero 6 has a loveable sidekick, a Stan Lee cameo and Fall Out Boy. However, Tangled has more emotion, a better story and the most tear-worthy moment in Disney history, so it beats out Big Hero 6. Frozen vs Moana: This will be controversial, but I really do prefer Frozen. For me, it has the better songs and storyline, and I can connect to it more than I can with Moana. Aladdin vs Hercules: This is also another hard pairing, as I really do love both of these films. What lead me to pick Hercules is the music. It has my favourite soundtrack of any Disney film, and matching the Gospel tone with the comedy format, the unique illustration style and greek mythology, it is unique and works brilliantly. The Little Mermaid vs Pocahontas: I am not that big on either of these films, but if I was to watch one I would pick The Little Mermaid. I find Pocahontas to be problematic, and The Little Mermaid has the better story. Mulan vs Zootopia: This one is simple, whilst Zootopia is a great film that deals with real life issues, can you really beat Make a Man Out of You? The Nightmare Before Christmas vs Beauty and the Beast: If you know me, you know I vote Beauty and the Beast. The songs, the storyline, the characters, how could I not? Up vs Brave: I was not a fan of Brave. Up however is emotional and a beautiful story. Toy Story vs Toy Story 2: The original Toy Story is the only one of the trilogy that I really remember, so it gets my vote by default. Coco vs Cars: I grew up with Cars, I had a Lightning McQueen cake when I was 8 years old and I loved the film. However, Coco was so emotional, and I loved the characters and story. It is easily my favourite Pixar film in years. This one was tough but I voted Coco. Toy Story 3 vs The Good Dinosaur: I have not seen The Good Dinosaur, so Toy Story 3 wins by default. Ratatouille vs A Bug's Life: I have seen both, but I don't really remember A Bug's Life. I remember seeing Ratatouille in cinemas and being taken by the story. Plus, who doesn't love a good story about food? Finding Nemo vs Inside Out: I never got the big fascination with Finding Nemo. However, Inside Out was a return to form from Pixar where they created a fantastic story based on emotions. Monsters Inc vs Cars 2: Who would vote for Cars 2 here? The Incredibles vs Wall-E: I love both of these films, but I think the hype of The Incredibles 2 is making me like The Incredibles just that little bit more. Tangled vs Frozen: I do enjoy Frozen, but Tangled simply has the better songs, music and art style. Hercules vs The Little Mermaid: This one is easy, I think The Little Mermaid is okay but I can watch Hercules over and over again. Mulan vs Beauty and the Beast: Both films do a fantastic job of dealing with feminism and family, but I just prefer the way that Beauty and the Beast deals with it. It is more relatable to me, having a book lover feel trapped and wanting more from life. Up vs Toy Story: I need to re-watch Toy Story, as I don't fully remember it and a lot of people consider it the best Pixar film. However, I connect more with the story of Up and the first eight minutes are the most emotional of any Pixar film. Coco vs Toy Story 3: Just like the last battle, I don't fully remember Toy Story 3 but Coco is a clear memory for me having seen it in cinemas this year. Ratatouille vs Inside Out: Inside Out was the film that really got me back into Pixar films, and for that it gets a place in my heart that Ratatouille doesn't have. Monsters Inc vs The Incredibles: These may be my favourite two Pixar films, so this was a tough battle to face. The reason Monsters Inc won is due to the amount of times that I watched this when I was younger, and how much I love the story and characters. Lilo and Stitch vs Tangled: This is when the battles get tough. The main reason Tangled won over Lilo and Stitch is due to the I See The Light moment. That moment alone makes me cry every time I watch it. Hercules vs Beauty and the Beast: The best two soundtracks of any film, I truly do love both films. What edges Beauty and the Beast forward is the story. A beautiful story about true love and family wins my heart every time. Up vs Coco: Coco is the film that is still on my mind months after I have seen it. Yes, Up has the saddest moments in any Pixar film. But, Coco to me is the most emotional film in terms of the family connections. Inside Out vs Monsters Inc: Inside Out might have made me appreciate Pixar again, but Monsters Inc was the film that first made me love the Pixar company. It wins outright. Tangled vs Beauty and the Beast: Beauty and the Beast is my favourite Disney film of all time. With the beautiful story, the incredible musical numbers and characters that you can't help but fall in love with, it is truly the perfect animated film. Coco vs Monsters Inc: Monsters Inc is my favourite Pixar film, due to the heart poured into it and the characters. I remember growing up with a Boo doll and loving it. Monsters Inc will always have a place in my heart. Beauty and the Beast vs Monsters Inc: For me, Beauty and the Beast is the perfect animated film. If you look in my room, I have so many Beauty and the Beast items from plushies to musical boxes. The magic that lies within this film is beautiful and I don't think there will ever come a Disney or Pixar film that will top the love that I have for Beauty and the Beast. That is my ranking of the DIsney/Pixar bracket. I had some controversial opinions here and I would like to know what you think. Do you love Beauty and the Beast as much as me, or does another film stand out to you? Let me know in the comments, I always like to read your responses!